Both Leesa and Purple are companies that bring quite a lot to the table. However, out of the two, the former may seem to have the upper hand on first glance since it has been on the block for quite some time now. Purple, on the other side, is the new kid entering the realm with tremendously serious hopes of sprinting through the ranks and making it to the top. Which one is better? Will Leesa hold onto its established reputation and prove to be the better sleeping solution? Or has Purple gone the extra mile to surpass its high quality? It's time to begin the Leesa vs. Purple showdown! The materials, as well as the construction in both mattresses, are rather similar in a sense. Both of them prefer the contemporary foam structure, and they don’t use coils. They are both layered, but they do reveal some serious differences upon closer inspection. That’s what we are going to take a look at. Leesa is a 10-inch bed which takes advantage of three different layers, including high-quality memory foam. The proprietary blend in the entire mixture, however, is the high-end Avena foam. While it has a lot of similarities with latex, it tends to be a lot more reliable and durable. Also, it has an extended lifespan, giving you a good value for your investment. The 1st layer is the one designed for cooling and comfort. It is made out of Avena foam, and it is two inches thick. It has a quick response, cooling capabilities, and bounce – and that’s why it is similar to latex. However, it is a lot stronger in comparison. The top layer, as well as the core memory foam, are designed to work in sync so that the bed can bring a rather adaptive feel, which is awesome for different types of sleeping preferences. The 2nd layer is designed for pressure relief and support. It is made out of regular memory foam. It is intended to provide you with the necessary pressure relief and to bring the support which compliments the comfort of the Avena foam. The 3rd layer, which is also the one referred to as foundational, is made out of support foam. It is 6 inches thick, and it acts as the base of the mattress. It is going to give it its overall shape and attributes for the convenient deep compression. This makes it supportive and appropriate for side sleepers and heavier ones. All in all, the mattress brings a nice combination of comfort and support. It is cool, and it is designed not to retain heat, meaning that you shouldn’t have to worry about waking up in the middle of the night because of hot temperature. It’s also important to note that the mattress comes with a cover made out of polyester and Lycra. The resulting top solution is durable, and it protects the bed while providing it with a very tight fit. The color is gray, which makes it very appealing, and it is extremely comfortable. The construction of the Purple is fairly similar, but it takes advantage of different materials. 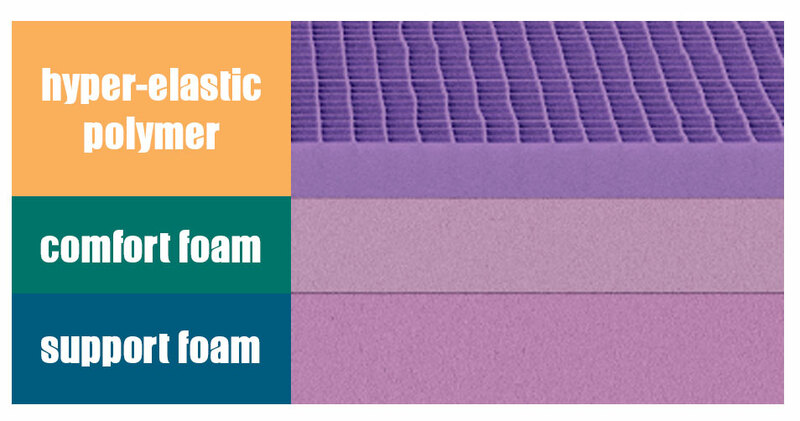 Instead of Avena foam, the bed uses a polymer which is hyper-elastic. We are going to take a closer look on that further below. It is a bit thinner, coming at 9.5 inches. Apart from that, though, similarities are seen when it comes to the 3-layer construction. The 1st layer is designed to bring you a nice cooling sensation and serious comfort. It is two inches thick, and it is made out of the polymer, as we've mentioned above, that’s hyper-elastic. It brings support, bounce, and pressure relief. At the same time, it is intended to keep the mattress perfectly cooled off. The 2nd layer is pure support. It is intended to ensure that you don’t feel any pressure and that your spine is perfectly aligned. It is 3.5 inches thick, and it’s made of high-quality polyurethane foam. It is placed right below the top layer of polymer, and it is going to deliver a major part of the support offered by this particular bed. The 3rd layer, which is also known as the base or the foundation of the mattress, here is a bit thinner than expected. It is 4 inches thick, and it will provide you with deep compression support. This means that it is appropriate for sleepers of different weights and with different sleeping preferences. The cover of the mattress is also quite important. It is a blend of polyester-lycra, polyester, and viscose. It is quite similar to the one which is brought by Leesa. It has a serious amount of breathability, and it’s rather thin. The idea is to provide you with a nice appeal without dampening any of the properties of the bed. Obviously, it is also quite critical to make sure that you take a look at the overall firmness, comfort, and the support which are brought by both options. These are likely to be the most important qualities to look forward to. Leesa attempts to hit the sweet spot, and it scores 6 out of 10 on the firmness scale. The intention is to capture the potential of the masses, as about 80% of sleepers prefer medium-firm mattress. The obvious attempt is to create a universal appeal so that it could capture the most serious demand. The initial sensation that you get when you lie down is quite pleasing. You should instantly experience the cooling, comfort, and the softness brought by the convenient layer of Avena foam on top. You can quickly see the resemblance with latex options as that’s what the foam is intended to do. The mattress manages to produce a very balanced sensation – something which delivers proper contouring without the sleeper having to feel enveloped by all the foam. The response from the Avena is also quite impressive. The support that the bed brings is solid. Regardless of whether you prefer to sleep on your sides, stomach, or back, the bed supports all positions quite conveniently. Additionally, you shouldn’t have to worry about pressure as it is geared for proper spinal alignment. 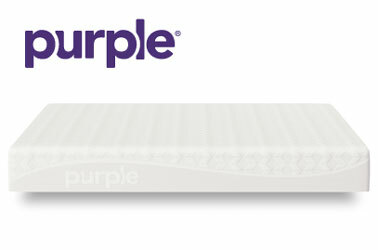 When it comes to Purple, the firmness of the solution ranges between 6 and 6.5 out of 10 on the firmness scale. The goal of the company is quite similar to that of Leesa, and it attempts to reach that feeling of universal comfort. Now, the important thing which is to be noted here is the top layer of hyper-elastic polymer. It is two inches thick, and it’s safe to say that it’s rather different on the market. This particular material is also quite comparable to latex. It brings similar response, bounce, and cooling. The initial sinkage is more like a gentle cradle. As weight escalates, and in certain positions, the sinkage gradually increases in order to adapt. On the other hand, we have the comfort. The cradle shouldn't be overwhelming and make you feel as if you are trapped. There is a high degree of elasticity which is going to enhance the pressure relief without having to change the support or the comfort that the mattress brings. Furthermore, the top layer is also responsible for serious cooling capabilities, and it’s amongst the coolest models on the market. This is thanks to the grid design of the top layer which is intended to enhance the airflow significantly and stay at a neutral temp. 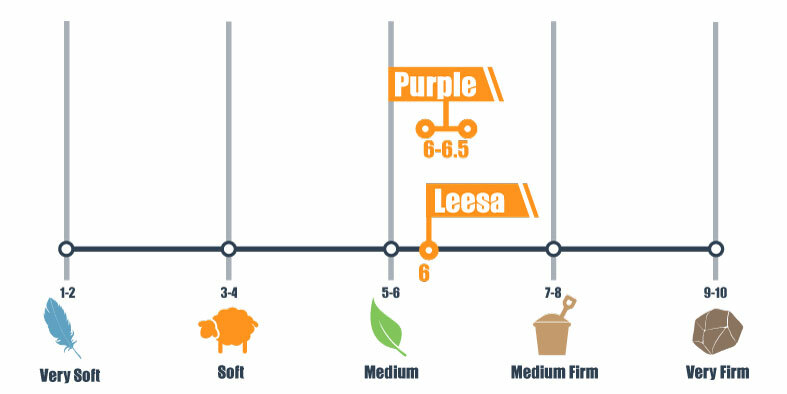 Should I buy Leesa or Purple? Obviously, this is the million dollar question. As you may have figured out from the overall tone of our review, determining a decisive winner is impossible. Both of these mattresses are great, and we'd have to call it a draw. However, to simplify the choice and make it a little bit easier, we’ve decided to include a few helpful tips. Want a universal feel – if you prefer the universal feel of your mattress, you can rely on the medium firmness of Leesa. With 6 out of 10, as well as the awesome combination of memory foam and Avena foam, bring an enjoyable sleeping sensation. Are looking for the perfect balance – the mattress brings a great balance throughout the entire surface. What is more, it is capable of accommodating different sleeping preferences. It should be a nice option regardless of whether you prefer to sleep on your side, back or you are an avid belly sleeper. Are into charity – Leesa has a serious donation policy where 1 unit per each 10 sold goes to homeless shelters and to anyone who might need. The program has already managed to donate more than 5,000 beds. This is definitely quite impressive. Are looking for something responsive – the top layer of hyper-elastic polymer is undoubtedly one of a kind. It brings responsiveness, unlike anything you’ve ever felt. Want a medium firm feel – the mattress is slightly firmer when compared to the previous one and it is leaning towards the 6.5 out of 10 grade. Lighter sleepers are highly likely to float more on top of the mattress as it wouldn’t sink as much. Want serious coolness – even though it’s a close contest with the Leesa unit, this one manages to show slightly better cooling capabilities. This is thanks to the unique top layer and its grid design which seriously enhances the air flow and does not hold heat. All in all, you can see it for yourself: both options are particularly formidable. They are great for all kinds of sleepers, and they can accommodate a range of preferences. They conveniently eliminate the unpleasant trapping sensation which is usually brought by the majority of foam mattresses. Through the usage of contemporary materials and blending them conveniently in well-thought-out constructions, both Leesa and Purple deserve your attention. It’s a draw – there’s no doubt about it. From here on, it’s a matter of personal preferences. For more options check our detailed reviews. 27 Unique Canopy Bed Design Ideas - Modern, Traditional and More!